I Love Dungeons & Dragons, it’s my livelihood and source of great joy. I follow a number of groups in numerous editions and a pattern seems to be emerging in 5E that troubles me. 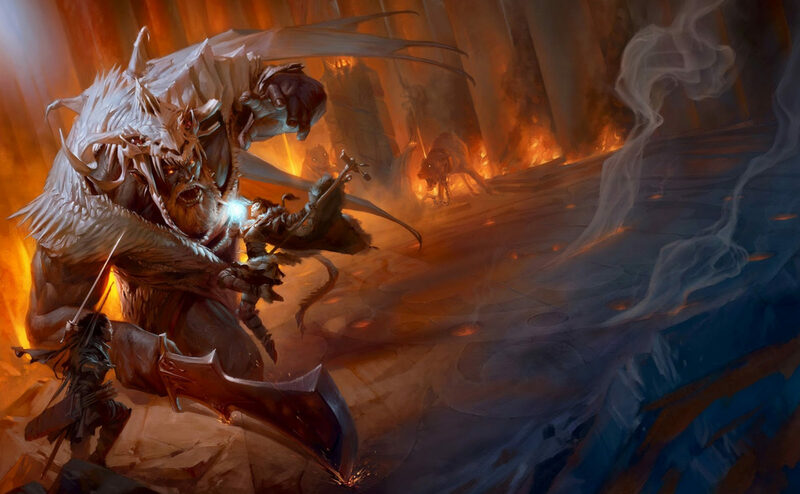 Although it may be kicking a hornet’s nest, I’m going to step up to the plate and voice the thing about Fifth Edition Dungeons and Dragons that I just don’t like. Am I alone in this gripe? Let’s start with a gripe sandwich. I’ll start with what I like the most about 5e before moving to the unpleasant business. I truly LOVE that fifth edition has brought so many new and diverse gamers to the RPG table and conventions. Clearly our friend Mike Mearls with Jeremy Crawford and the WOTC team brought a quality product that lines up with the target market. The whole team put their ears to the community to give them something they wanted. They added in NUMEROUS house-rulings, and built something completely different from the previous edition that, let’s face it, wasn’t received as well by the community. People defend the system like a religious text, so clearly they love it. So much, that I am hesitant to release a blog post with a criticism of it. I will also preface my gripe with the fact that I have released almost all my titles with 5E rules and compatibility. The ire that critique of the system raises is almost, in itself, a small gripe about it. So let’s move on to the issue at hand. I will also preface the following and above that I already KNOW that your group doesn’t do this. That you feel I am utterly wrong. That the system can be bent to fit all styles of play…. I know… you hate me for a critique of 5E. All editions can be bent for various styles of play, and we all have examples. I am stepping back from that muck pit to look at this topic. My first reaction to the preset background stories was, “Yeah ok whatever. it gives some inspiration for those who don’t want to think of a background.” Then when I realized these preset backstories weren’t just “dungeon dressing” but actually things to choose with mechanics attached, I recoiled in horror. To me this feels counter to the spirit of the game. Yes, I know you can write your own and make them up, but then your DM needs to layout rules, bonuses, and a path through the various feats and abilities. Is This a Good Character to Play? A question that gets asked in 5E groups more than any other. Variants of this question come up and it is related to character builds. What the inquisitor means is, “Will this character survive? Is it Min/Maxed properly to try to get an edge on the mechanics? Can I “win?” My answer is unapologetically, “If it seems like a fun character to you to play, ONLY then is it “good”.” I don’t know what it is about the system that seems to entice the idea of maximizing numbers to get an advantage. I admit It would happen on occasion in 2E as well I.E. strong fighters with high dex taking darts, then specializing. But for some reason, it seems to be the standard mindset for players in the 5E groups I frequent, not the exception. I would like to encourage 5E players to NOT think about builds, numbers, or system weaknesses at character creation. DISCARD everything you read about backgrounds, archetypes, feats, skills, and how they combine. DISCARD everything you know about stats, rules, advantage, disadvantage, AC, DC, HP, and close your eyes to think about what kind of hero you imagine in a fantasy RPG setting. From the stories of old, new, books, movies, and stories, imagine what type of character excites you. Imagine what YOUR hero in a fantasy realm looks like, talks like, acts like. What’s their story? WAIT…not those 5E backstories…. this is your own imagining. Is it a lithe elf of the forest, surviving in the wilds in search of their friends? Is it the popular wise-guy from the city who is everyone’s friend and shmoozes them out of money? Imagine your hero the way you want to play it. Whatever way and whatever style seems FUN to you and your friends at the table. Take that image and THEN apply the tool box of modules and numbers in the players handbook to make that image happen. The numbers aren’t your character, they only describe your character. The numbers aren’t your character, they only describe your character. That is my biggest gripe about 5E summed up in one sentence (above). Perhaps it’s a player gripe, I’m not sure. I strongly feel that the numbers, feats, abilities, and all that should be used to describe our characters, not the other way around. 5e can accommodate all sorts of styles of play and approaches. If you are finding yourself opening the book to find the best numerical advantage in damage and abilities, I really challenge you to stop, close the book, and imagine the FUN character first. The game can handle your presence without min maxing the numbers. There is no “winning” in D&D. If you are only carving numbers, you are thinking of winning and not telling the story of your band of heroes. The system is ready for this style of play. You can even trim everything back to the core, maybe replay Phandelver one more time with the intro set rules. Your DM may even be willing to go beyond level 3 with the intro box rules. That intro box set really put the story mode in front, it’s what excited a whole new group of gamers to play – reconnect to that excitement of adventure and hold onto it. Humans get competitive, it’s ok. We also get cooperative, you don’t need to be great at everything, it’s why we adventure in groups. It’s why so many previous edition gamers play Holmes, BECMI, 1E, 2E, we are reconnecting to what excited us about playing in the first place. Even previous edition gamers sometimes do this min/maxing business. People who only play the number often lose the magic and eventually fade out of the hobby. People whose eyes glaze over at the table and can “see” their hero creating the story as it unfolds, tend to immerse deeper into the game and find more joy in it. There is no best system or style of play. The best system for you is the one that generates the most fun. Role playing games aren’t games of numbers. They are ROLE PLAYING games that use numbers to tell a story. I hope this helps enrich your gaming experience, and thank you for tolerating my 5E gripes. Now feel free to voice your ire in the comments. Not bad. It all comes down to your style of play. If your player wants to be able to kill Tiamat in 2 rounds, then it’s definitely a min/max player for you. Now, we would all give that player the side eye and say “sure you can kill Tiamat in 2 rounds”. On the other side of that coin, the DM could help that player build a character to (try) to do what he wants to do. Perhaps his city was wiped out by the dragon queen and he’s the only survivor hell bent on revenge, so he dedicates his whole life to taking her down. Yes it sounds like I’m defending the system, and perhaps I am, but I believe it’s what you make of it. Help your short sighted, min/maxing, video game loving, diablo-type player make a character that they’ll enjoy in the type of game you wish to run. Thanks for the insight, and, as a side note, I’ll definitely be changing the way I see backgrounds in the 5e game from now on. What Is Best In Life! what i actually think this shows is amazing growth in the games player base. Many of these types of questions arent coming from experiences adventures with rpg background. there finallt coming from people with a video game background that discovering d&d. they dont yet understand what role play for fun is and thats okay. they are taking there first steps into a larger world. So i think those questions arent gripes with the system so much as with tge expanded player base. 5th ed doesn t punish failure the way online rpgs can. you have to account for the fact that if your only rpg pre experience is video games or say an online rpg your very use to having to check what the optimal build is because failure to play optimally is meet with them being kicked out of a raid or group. Part of the numbers-focus comes from the Adventurer’s League play. I have been playing that for some time with a character I enjoy (halfling bard). But he is clearly sub-optimized to character’s built specifically for the League (I am looking at you, Tabaxi monk). That can lead to a “chasing the numbers” mentality. However, I do not think this would be as big a deal in a true campaign, where a group of characters would be together for a long time.